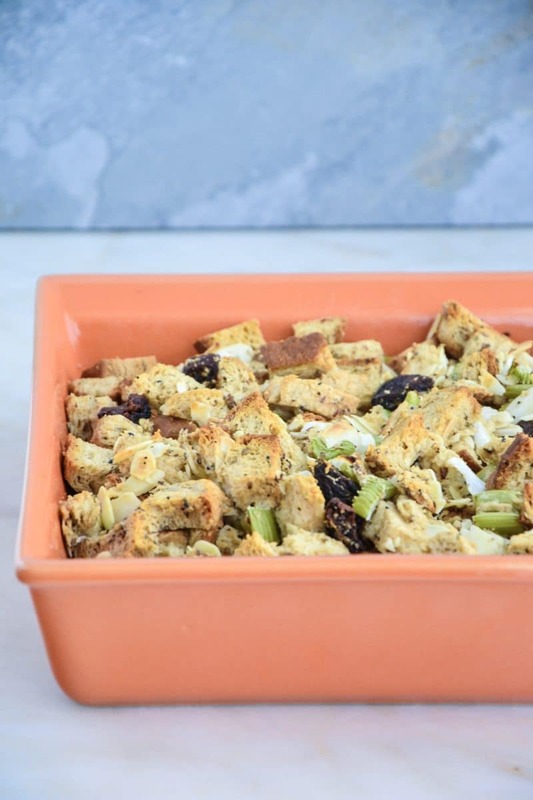 This cozy gluten-free stuffing recipe is made with rye bread, celery, onion, and dried apricots. It’s the perfect anti-inflammatory side dish. Click the PLAY button below to hear me walk you through the steps of how to make this gluten-free stuffing. Remove the bread from the bread bag and leave it out on the countertop overnight to get a little bit ‘stale’. 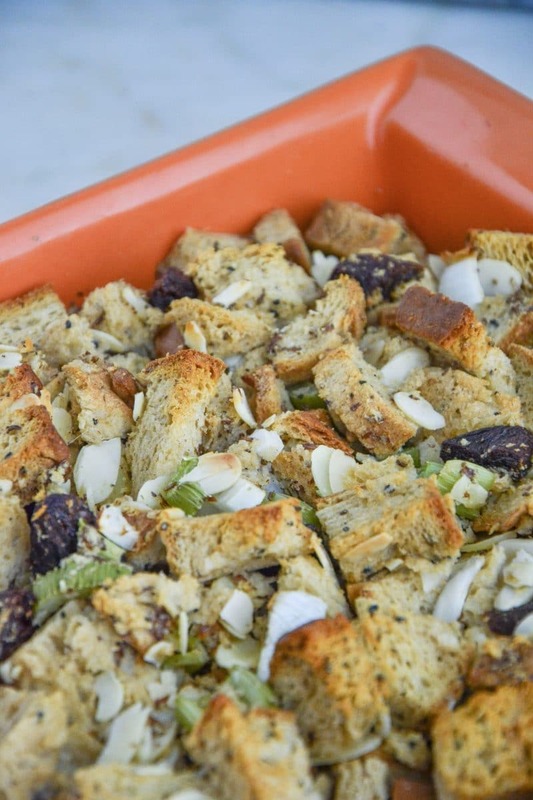 Combine the sliced bread cubes with the sauteed onions and celery along with the flaxseeds + water (in place of an egg), vegetable broth, almonds and apricots into a baking dish and BAKE! Remove from the oven and…. Note: I love using the Canyon Bakehouse brand of gluten-free bread. In this recipe, I used their Rye bread. 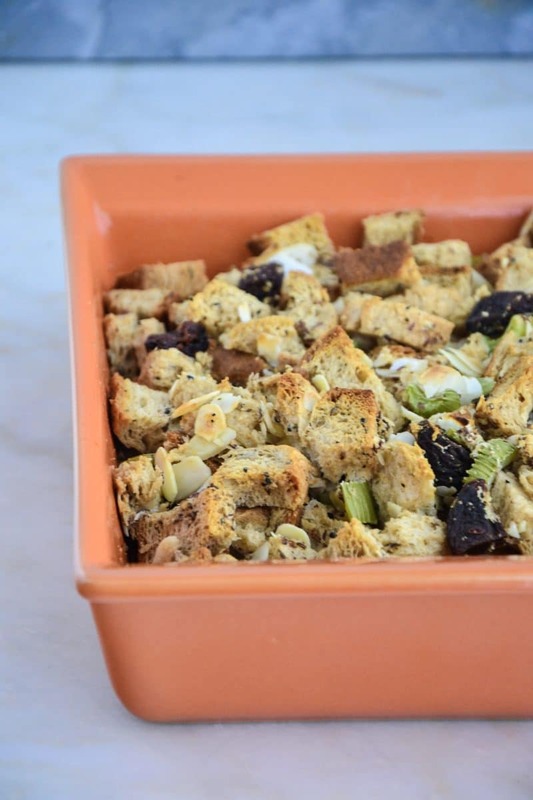 Who doesn’t want an easy gluten-free stuffing for Thanksgiving? I don’t know about you but the thought of making a gluten-free stuffing recipe sounds exhausting. Doesn’t it? This stuffing is not time consuming. You know I like to make my recipes super dupe easy and that’s what I did for this stuffing so that you can make this in a jiffy the morning of Thanksgiving without stressing out. Not only is this stuffing gluten-free, it’s also vegetarian, as well because we’re using vegetable broth here. Feel free to use chicken broth if you aren’t vegetarian or if you prefer the chicken flavor. Whatever floats your boat. If you do choose to use chicken broth, I highly suggest you use organic chicken broth. Pacific Foods is a great brand that you can purchase at Whole Foods Market for Vegetable Broth or Chicken Broth. That’s the brand I use. The BIGGEST tip for making this easy gluten-free stuffing is that you MUST leave the bread out on the counter to get ‘stale’ the night before you make this recipe. Yes, that means, remove the bread from the bread bag and place it on the countertop out in the open. I know this sounds crazy but trust me here. This gluten-free stuffing will not be as good if you don’t do this important step! 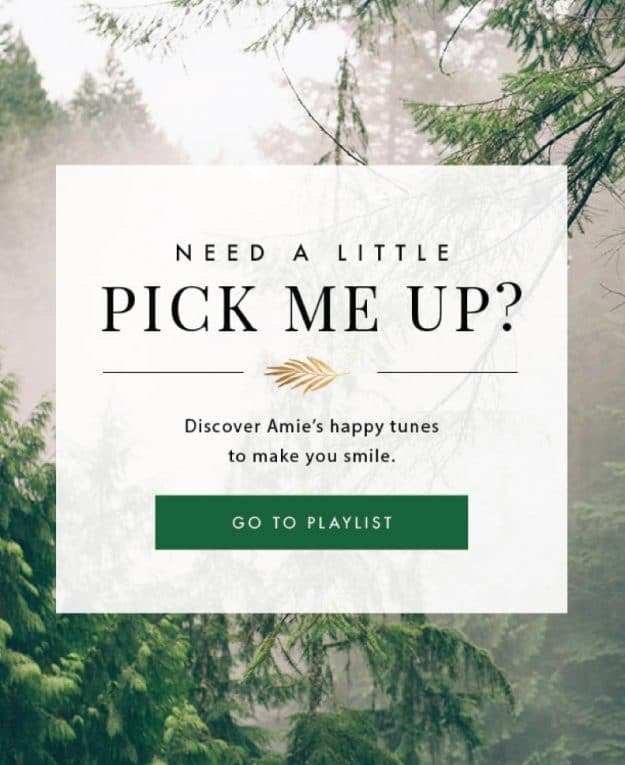 That is the only tip you need to remember. It makes a HUGE difference. 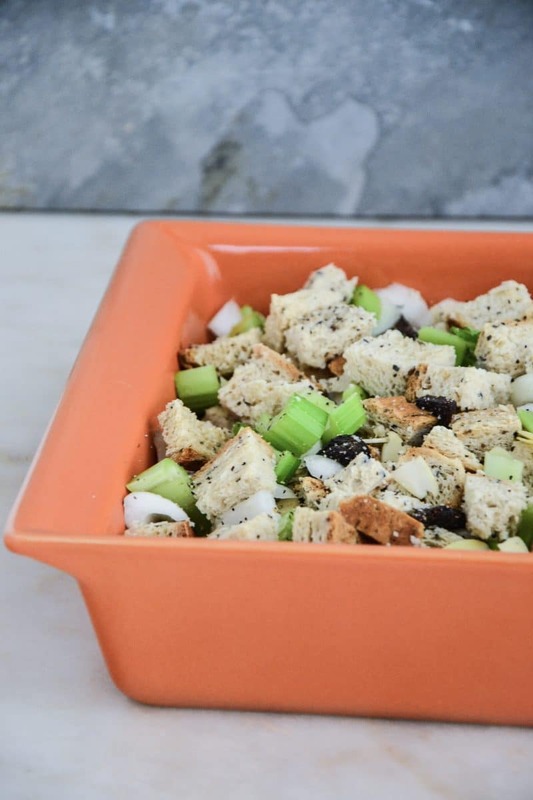 This savory stuffing recipe is made with gluten-free rye bread, celery, onion, and dried apricots. It's the perfect anti-inflammatory side dish for Thanksgiving. Let the bread sit out on the counter out of the bag on a plate overnight to get stale. The next day, cut the bread into ½ inch cubes with a sharp knife and set aside. Preheat the oven to 350 degrees F. Prepare a large baking dish with olive oil and set aside. Sauté the onion in a large skillet with the olive oil. Season to taste with a pinch of salt and pepper and cook until the onions are translucent, about 7 minutes, then add the celery and cook for another 5 minutes or until tender. Meanwhile, combine the flaxseeds/water in a small bowl and let sit for 10 minutes or until it forms a gel consistency. This acts as your egg in this stuffing. 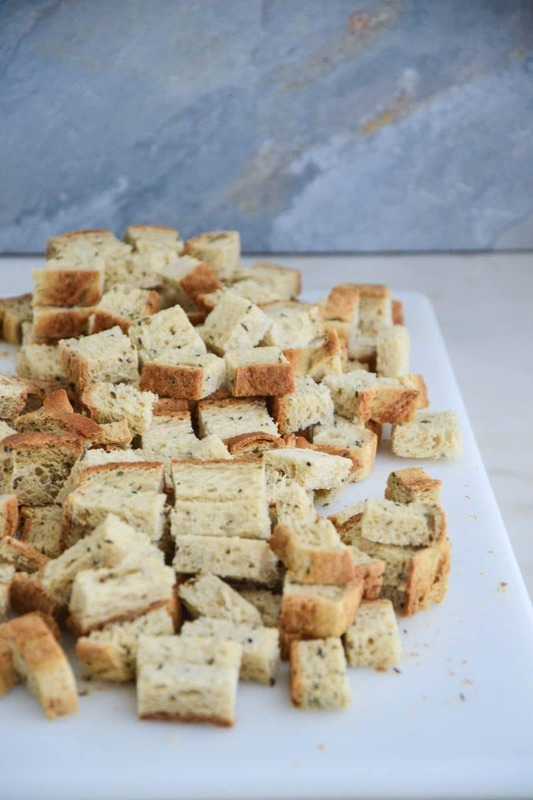 Combine the bread cubes, onion mixture, flax egg substitute, vegetable broth and all remaining ingredients in a large baking dish and gently toss to combine. Bake for 30 minutes or until golden brown. Remove from the oven and serve warm. Keeps for up to 4 days in a sealed container in the fridge.